Lock in a great price for The Blue Palms - Fistral Beach – rated 9.1 by recent guests! The property was cosy, tidy and very close to the beach. Nothing was too much trouble for Aaron (owner) from a dvd player to heating. Thank you for making our stay memorable. Clean, quiet, excellent shower and big, comfortable bed and only 1 min walk to the beach. I can’t ask for more than that. Oh, great communication also. It is only a short walk to Fistral beach. It has a wonderful shower and the bottle of wine in the fridge was most welcome. The facilities were very very good. Fabulous superking bed, and bathroom. Shower was excellent. Lovely room with great location. Host were great and went out of the way to make sure we were comfortable. Nice and welcome touch with the wine and crossants but sadly the seagulls had the croissants! Cheeky monkeys! we did not really see anything other than the property, as my husband had a heart attack and was taken too truro hospital, the owners where amazing and could not do enough for me, would definitely recommend the blue palms, fistral beach. We loved this place super cosy and in a great location. The Blue Palms is 650 feet from Fistral Beach. The King size room offers beautiful garden views, perfect for a romantic beach getaway, with a south facing deck, barbecue, and free WiFi throughout. The en-suite has a walk-in power shower with free toiletries. There is a fridge, microwave, toaster, kettle, and kitchenware. Towels and linen are all provided. Newquay Cornwall Airport is 6.2 mi from The Blue Palms. Newquay Golf Club is 0.7 mi away, while Newquay Blue Reef Aquarium is 1 mi away. 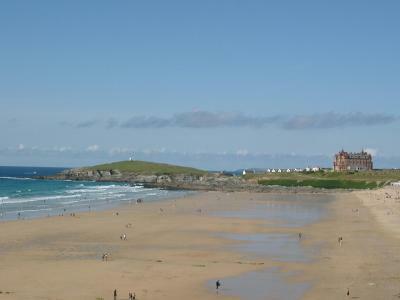 When would you like to stay at The Blue Palms - Fistral Beach? This double room has a microwave, toaster, kettle, fridge, outdoor barbecue with deck. House Rules The Blue Palms - Fistral Beach takes special requests – add in the next step! Please inform The Blue Palms - Fistral Beach of your expected arrival time in advance. You can use the Special Requests box when booking, or contact the property directly using the contact details in your confirmation. Aaron is a great owner. Very accommodating. We would have liked a top sheet on the bed so we could turn the duvet back if too warm.Need thicker pillows. The light over the wash basin could do with being separate to the main light, so can be put on without the fan during the night if just going for water. The room is warm comfortable for 2 people ..big cosy bed ...nice touches ..with wine and croissants in the fridge ...plenty of clean towels ..a pleasant stay .,.. Shower was amazing, bed was very comfy. Hard to find the as no sign outside the house, so took a while. The cold summer weather and lack of public transport as we had no car. Lovely garden and great location.